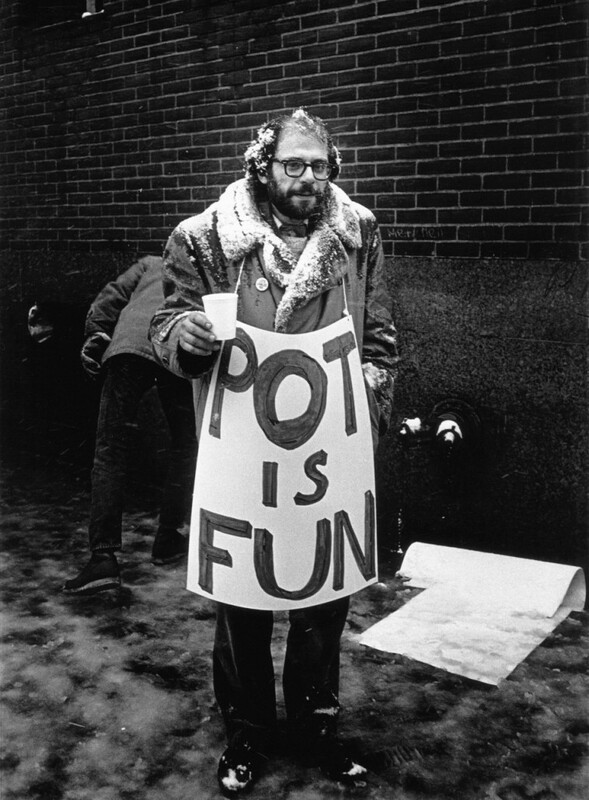 ☛ Robert Anderson Gallery: American poet Allen Ginsberg at a marijuana rally with a sign that reads “Pot Is Fun”. Photo by Benedict J. Fernandez. 1963, 1964 or 1965. Large format retrieved from Beatnikhiway. Besides, Sloman had always loved the poster of Ginsberg that was sold in the mid-sixties, the one where he was waring a huge placard at an early marijuana demonstration like some bearded, horn-rimmed rent-a-vagrant advertising three-dollar haircuts, a styrofoam of coffee gingerly held aloft, with a light snow topping almost bald pate like white laurel leaves. The sign, crudely hand-lettered, read “Pot Is Fun,” and the sly, sheepish–no, elfish–grin on Ginsberg’s face was testomony to that” (New York: Bobbs-Merrill, 1998, pp. 171-172). On December 27, 1964, GINSBERG and ––––– had marched in front of the Department of Welfare Building, East 9th St. and Avenue C, with signs reading “Smoke Pot, It’s Cheaper and Healthier Tha Liquor” and “Pot Is a Reality Kick.” There individuals are members of an organization called LEMAR (Legalize Marijuana) and their names appear in the files of Interpol. (1998, p. 221). Photographer unknown. 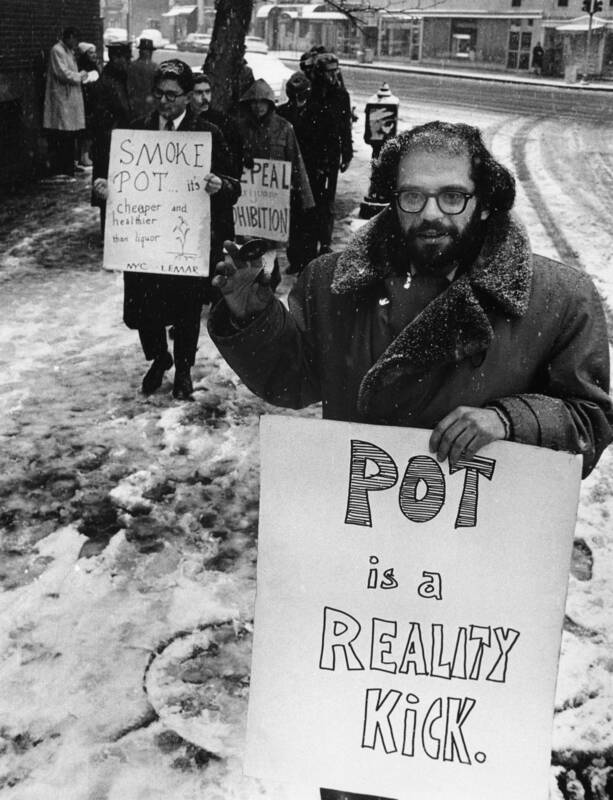 Allen Ginsberg holding a sign that reads: “Pot is a Reality Kick”. Maybe from Dec. 27, 1964. Large format retrieved from Imgur. Allen Ginsberg leads a group of demonstrators outside outside the women’s House of Detention in New York City’s Greenwich Village advocating the use of marijuana. Ginsburg is shown carrying a sign “Pot is a Reality Kick.” (Corbis stock Photo ID: BE026409). For more details about Allen Ginsberg position towards marijuana, one can read his essay “The Great Marijuana Hoax” (first published in The Atlantic Monthly, November 1966, Vol. 218, No. 6, pp. 104 – 112).